Got fun fabrics? Applique a set of blooming accent pillows with layered spring flowers! 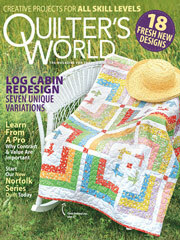 The bright and cheery pattern provides lots of room to display your favorite quilting designs. Back-zipper closure. This e-pattern was originally published in Pillow Pizzazz.